Consult this list of shrubs before you shop at the nursery. This top 12 list describes popular specimens for the yard as well as some bushes. Other bushes could easily have been included in this list including the small evergreen bushes so popular as foundation plants. But the kinds of shrubs presented in this listing are a good place to start, especially if year-round color in your landscape is your goal. These are some of the most colorful specimens hardy enough to grow in a Northern landscape. The first 11 bushes on this must-have list of shrubs all merit inclusion based on the color they bring to the yard during a particular season (although some offer multi-season interest). 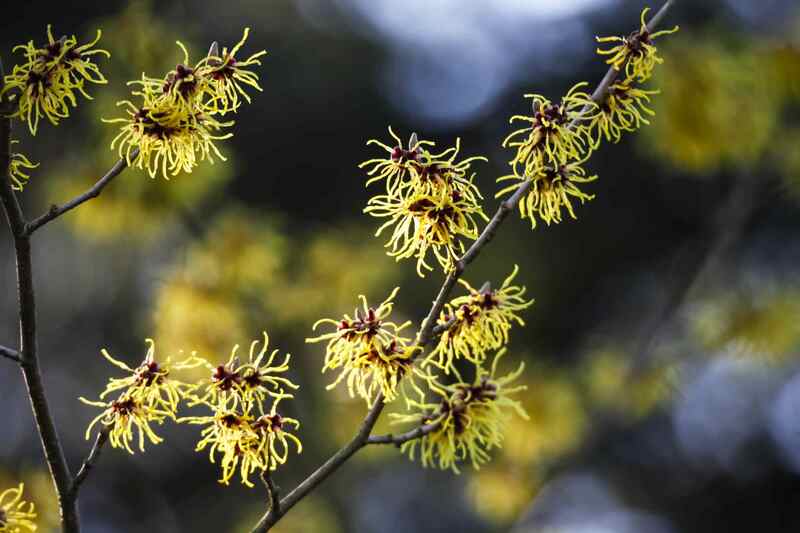 Witch hazel has been placed at the beginning of this list because it ushers in the growing season, at least in a zone-5 landscape, where it is the earliest plant to bloom. Flowering as it does in February or March, growing a witch hazel (Hamamelis x intermedia) in your yard gives you the jump on everyone else in the neighborhood, in terms of having something in bloom in the landscape. Witch hazel beats Forsythia to the punch in blooming, and it is not nearly as common. You would very likely be the only one in your neighborhood to grow witch hazel, whereas several of your neighbors may grow forsythia. Common or not, forsythia still belongs on a list of shrubs that are must-haves. Not only is forsythia a vigorous, beautiful bush, but it is also an early bloomer (usually next in line among bushes after witch hazel). The blossoms of the common lilac (Syringa vulgaris) pick up where forsythia's leave off. This May-flowering bush has one of the yard's most fragrant flowers. Although various cultivars are now marketed (such as "Bloomerang" and "Miss Kim"), many gardeners prefer the smell of the old-fashioned, common lilacs. As a flowering bush of late summer with a long blooming period, rose of Sharon (Hibiscus syriacus) occupies something of a strategic spot on this list of shrubs. It helps bridge the gap in yard color between the spring displays put on by flowering bushes and displays offered by bushes with fall color. Speaking of bushes that offer fall color, Fothergilla puts on some knockout autumn displays. It is, indeed, fothergilla's fall foliage that earns it inclusion on this list of shrubs. Fothergilla does, however, provide interesting bottlebrush-looking flowers in spring, too. Like fothergilla, oakleaf hydrangea (Hydrangea quercifolia) is a bush that boasts multi-season interest. But while its flowering period is in the summer, oakleaf hydrangea really comes into its own in autumn, when its leaves turn beautiful colors. For good measure, its peeling bark adds winter interest to the yard. Hydrangea shrubs, in general (there are many kinds), come in handy for those trying to bridge color gaps in the landscape. As a shrub that blooms in early summer, hydrangea begins blooming after the spring bloomers are spent but before rose of Sharon starts to flower. The "Elegantissima" cultivar of red twig dogwood (Cornus alba) outdoes even oakleaf hydrangea. A titan of four-season landscaping, this plant offers year-round visual interest. But despite bearing spring blossoms, two-toned leaves in summer, and berries from summer to fall, clearly, this plant's common name explains the main reason people grow it: namely, the bush's red twigs, which are brightest in winter. No list of shrubs would be complete without including an evergreen or two. Hollies (Ilex) are broadleaf evergreens, famous for the bright red holly berries with which they festoon the winter yard. Cotoneasters also offer red berries, but they are deciduous. There are all kinds of hollies, in all shapes and sizes, including the regal pair known as Blue Princess and Blue Prince. King's Gold and Gold Mops are popular kinds of false cypresses (Chamaecyparis). Bearing golden foliage, these evergreens are especially useful when grown along with plants bearing so-called "black flowers" (really a deep purple, in most cases) or dark leaves to create striking landscaping color schemes. As evergreens, bushes such as Gold Mops offer year-round color for the yard. One of the nice things about Stewartstonian azalea (Rhododendron x Gable "Stewartstonian") is that it is an evergreen type of azalea. Because it is evergreen, it offers winter interest. But this beautiful plant offers so much more than that: Its fall foliage is red and even redder are its spring flowers. No list of the best shrubs to grow would be complete without mentioning roses, one of the best summertime plants that you can grow. But many people new to gardening fear the prospect of having to care for rose bushes. The fact is that there are many kinds of rose bushes that are easy to take care of. Rosa rugosa may be the most famous of them. Hardy hibiscus (Hibiscus moscheutos) is the one plant included on this list of shrubs not so much for its ability to help bring year-long color to the yard (although it surely does that, too) as for its novelty (at least in northerly zones). For hardy hibiscus sports one of the largest blossoms you'll find among hardy plants in northern climates, earning it the nickname "dinner-plate hibiscus." It tends to bloom at about the same time as its relative, rose of Sharon.